A motorbike, two heads of antlers, a billiard table and a bonsai tree. Somebody’s idea of the 5 most important things to take to Spain. I suppose it must make sense to them. Conveniently, the person who had booked three quarters of Graham’s transit van for their antlers and other valuables, had left room at the back for my stuff. Mum’s bureau was the main thing. Sturdy and made of burnished rosewood with rows of compartments and some secret drawers that had captivated me as a child, it is a piece of furniture which I’ve known all my life. One drawer still full of unsorted papers, including an envelope of all the letters l ever wrote her. A shock to find as l had gone through the desk, throwing away the collected paraphernalia of a life – diaries, old cheque books, receipts and instruction booklets for items long discarded. The bureau produced a binbag of detritus, nothing worth keeping, the ordered clutter of one’s day-to-day existence. And the letters. A regular correspondence from 1978 to the early 90s, from my time in rented flats in Lancaster and Leeds as a young Assistant Stage Manager, then in touring theatre. Postcards tucked in with some of the letters, tracking the progress of the tours around the “number two circuit”, large towns and small cities, 600-seat playhouses and arts centres. Letters full of irrelevancies, odd funny stories about my theatrical digs or a late-night adventure in some faceless provincial town. Nothing of import, yet each one smoothed flat and stored. I hadn’t known, nor expected that. Still unsure how to react, how to feel. So the bureau gets draped in bubble-wrap and a blanket, and loaded onto the back of the van. 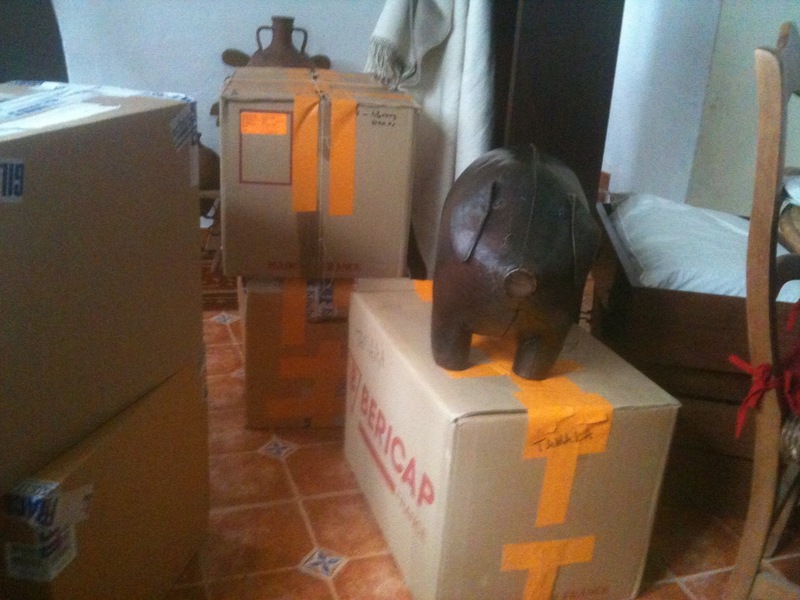 Four cardboard boxes of books, walking boots, photos, CDs, bedding. Hard to remember, though packed only a week ago. There’s a bonus space on the van for the bookshelf from the hallway of mum’s bungalow. Not a large one, but without it her empty home looks suddenly emptier. The final small space on the van is reserved for the pig. Forty-seven years old, he’s scratched and his skin sits loosely on whatever his insides are made of. I was seven when we moved to Yorkshire, and Dad announced that if we were to live in Yorkshire he wanted to keep a pig. Horrified, mum bought him a life-size black leather pig, a footstool l think (though never a comfortable one) and informed him it was the only pig he was having. In all her moves since his death in 1975, the pig and the bureau are the only things that made the move with her every time. Now both are on Graham’s van, heading for the ferry to Santander. The motorbike, two heads of antlers, the billiard table and the bonsai tree may have back-stories too. To me, somebody else’s choices of what to surround themselves with in Spain seem odd. My choices would seem just as odd to others. After slamming the doors on the van and waving Graham off in the November dark and drizzle, l turned on the computer to find a Facebook thread started by a friend in Spain: “What is the most useless thing you brought with you when you moved to Spain?” Electric strimmers and metal detectors came up a few times. A husband was listed once! Nobody mentioned antlers. Nobody mentioned a battered old leather pig. Nobody mentioned an envelope of thirty-year-old letters. This entry was posted in Dorset, Spain and tagged Andalucia, Axarquía, Colmenar, Dorset, Mum, Shaftesbury, Spain, SpanishBlog, Tamara Essex by tamaraessex. Bookmark the permalink. On a trip back to the UK earlier this year, my wonderful Aunt Lily, who sadly passed away in July, suddenly produced a package from one of her bureau drawers. She gave the envelope to me, and when I opened it saw every postcard I had ever sent her, all neatly bundled in elastic bands. I also have every drawing and letter my son wrote to me when he was a little boy – and they were possessions I was never going to leave behind in England, when we emigrated to Spain. Over Christmas-time a couple of years ago, we all sat for hours with a suitcase of written memories spread all around us, laughing until we cried. What a lovely story Marianne! I know the bureau will give me years of happy memories 🙂 And I’m sure the bonsai tree will give its owner’s heart a lift every time they see that, too! I couldn’t leave behind my Chelsea FC programmes, some of which were passed down to me by my grandfather. Of course, I’ll be handing these on to my own children. One who already is the proud owner of Frank Lampard’s boot which I caught after he threw it into the crowd following a historic win over Liverpool back in 2003.